Amidst the usual Tuesday night revelry heard on the streets of College Avenue, the unusual sound of tears were heard during a candlelight vigil organized by student leaders of Chabad Jewish Student Organization this Tuesday night to mourn the brutal deaths of a mother, father and three children, including a 3 month old girl by the hands of terrorists in Itamar, Israel on a Friday night over spring break. $485 was collected at the vigil for the remaining children, with more expected during the next few weeks of collections by the group. Donations can continue to be made via www.chabadnj.org or by mailing to Fogel Family/Chabad, 170 College Ave., New Brunswick, NJ 08901. The brothers and pledge class of AEPi Fraternity also attended this memorial service in order to show unity and support for the community. 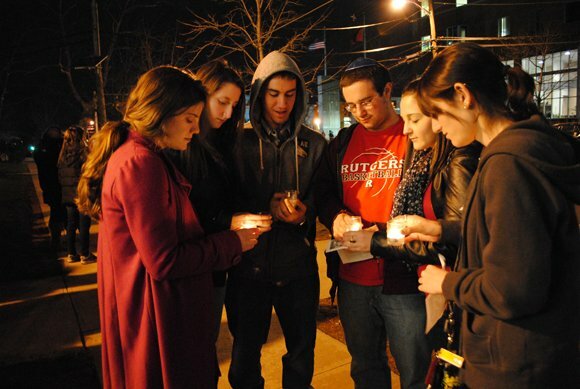 Michael Albalah, a Rutgers junior, led the service with a passage from Psalms, and Ben Bouskila, a Rutgers senior and co-president of Chabad, gave a description of the horrible sequence of events that took place in Itamar on that fateful Friday night. 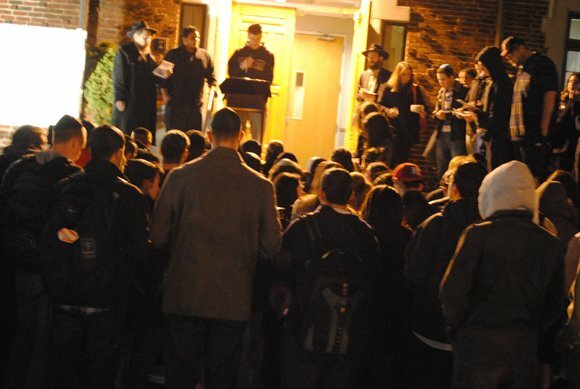 The crowd of students held candles as they listened to the words being spoken. On a regular Tuesday night they come to the Chabad House’s JewCrew Café and enjoy a hot meal, live entertainment and the company of their friends. But this Tuesday night they came together for a different purpose, one which led them to stand united on the streets of College Ave. There they stood in the darkness of the night, but with a determination to show that no matter how dark the world may seem or feel, light is just a single action away.